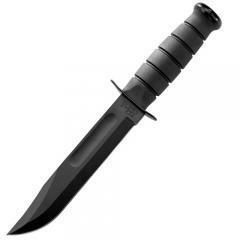 The Full-Size Black Straight Edge KA-BAR Knife is a large, fixed blade utility knife based on and brought to you by the same company as the original Marine Corps fighting blade. Its broad, 7-inch blade is made of durable 1095 Cro-Van steel and flat ground for extreme sharpness. Its fierce, clip-point style, plain cutting edge make it an ideal all-purpose knife capable of slicing as well as piercing with impressive handling. The Kraton G handle is grooved and features a bold center swell, providing the secure grip needed for demanding outdoor and combat work. The knife includes a leather sheath for protection during storage and safe portability. It's a little bit big for my hand. But I have rather small hands. However, great knife and I wanted the full-size for my collection.